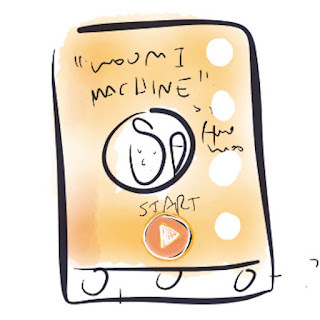 An early sketch of Woomi's app. 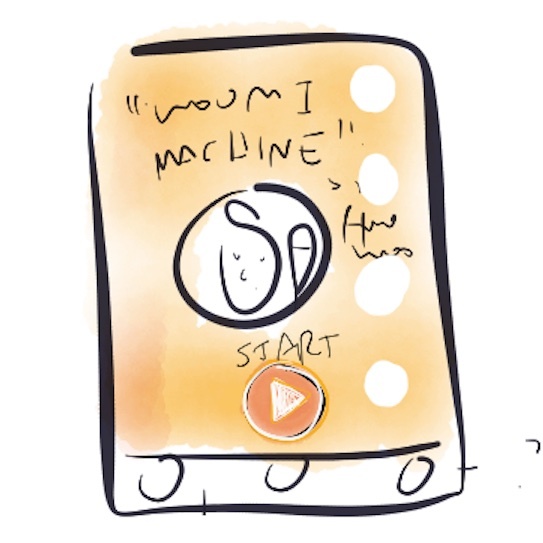 I imagined Woomi's app to be an adventure story with many interactive pieces. Users would control crazy machines and vehicles as Woomi plotted world conquest with his clones. Of the many software development kits to use, I eventually picked Corona SDK because it can build 2D apps that run on both iOS and Android platforms. It's also free. My mantra throughout: "If teenagers can learn this, so can you!" Woomi's crocheting/cloning machine, before and after. 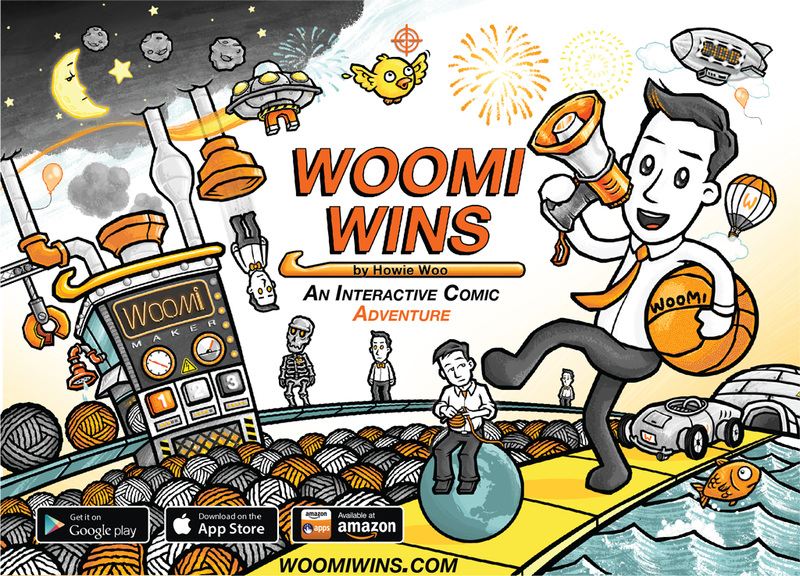 Woomi Wins was drawn with the same Wacom tablet I've used to draw for print publications since 2004. I also used custom Photoshop brushes that mimic natural media. A speed bump: the app required three sets of each drawing, to match the resolution of a user's device. Also, my 2010 laptop liked to crash a couple of times a day. Remember to backup! The spacebar too stopped working, so I used a clicky-sounding external keyboard. Recording foley of dropping boxes&pylons for the app's sound fx. Classy setup, I know. Recording mom's harp skills for the 'Woomi Wins' app. VIDEO: Rehearsing the theme-song I composed for 'Woomi Wins'. Me on the theremin, mom on the piano! I used Audacity—another free program—to edit all the sounds. Publishing an app on Apple's App Store and Google Play invites a global audience, but it costs $100US/yr to be an Apple developer, and a $25US one-time-fee to be a Google developer. Both companies also take a 30% commission from each app sold. It's free to be an Amazon developer. Woomi Wins finally landed in the app stores on September 15, 2015—at $1.99US—among the millions of other apps. Woo! If you download Woomi Wins onto your phone or tablet, I hope you enjoy Woomi's comic, cosmic misadventures! The app was made with love and built to entertain, clear of ads or in-app purchases. When learning any new craft, confusion and frustration will greet you. Stick to it, and creative joy will greet you too. Whether crocheting or coding, even basic techniques can lead to detailed designs. And fun stories can be told with those designs. 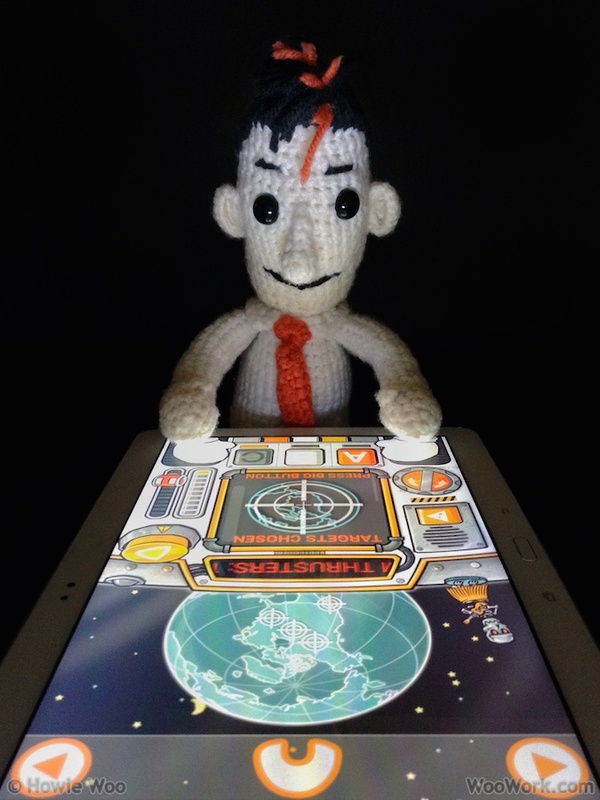 Thank you for all your support—then and now—from crochet to code! Woomi was brought to yarn life in 2008 as my alter-ego, but he grew his own feisty personality over the years. 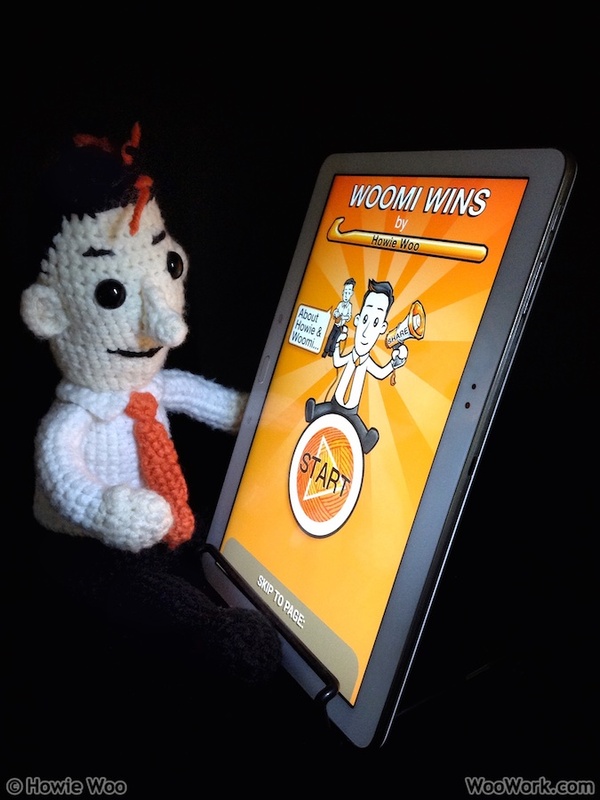 Today, Woomi is brought to interactive life in Woomi Wins, a new app that's available in the App Store and Google Play. 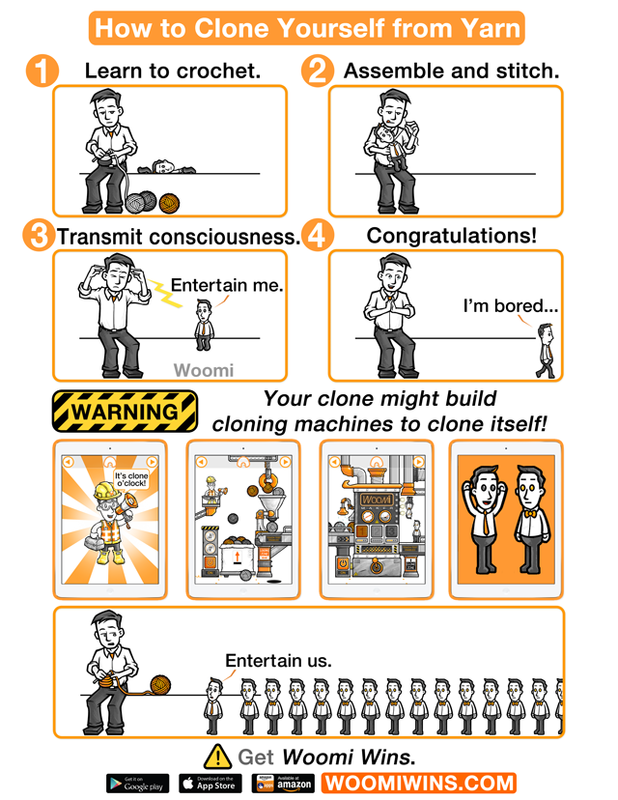 cloning machines to launch a world invasion from space! 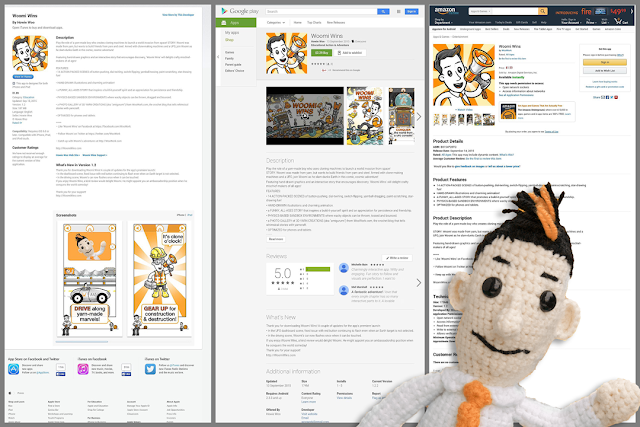 Woomi was made from yarn, but wants to build new friends from yarn and steel. Armed with clone-making machines and a UFO, join Woomi as he slam-dunks Earth in this comic, cosmic adventure! 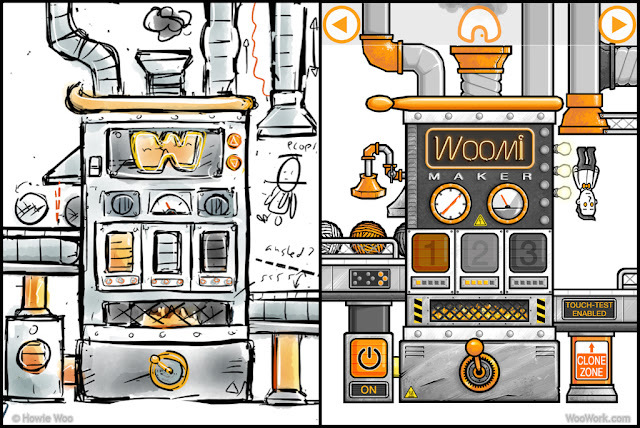 Presenting hand-drawn graphics and an interactive story that encourages discovery, Woomi Wins will delight crafty mischief-makers of all ages! 14 ACTION-PACKED SCENES of button-pushing, switch-flipping, yarnball-tossing, paint-scratching, planet-twirling, star-drawing fun! a FUNNY, ALL-AGES STORY that inspires a build-it-yourself spirit and an appreciation for inventiveness and friendship. HAND-DRAWN illustrations and charming animation! 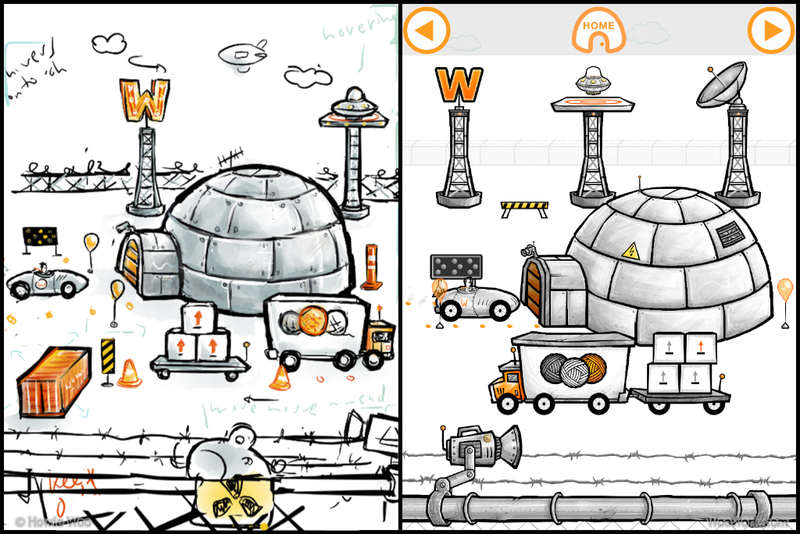 PHYSICS-BASED ENVIRONMENTS where wacky objects can be thrown, dragged, stacked and bounced. a PHOTO GALLERY of 3D YARN CREATIONS (aka "amigurumi") from WooWork.com, the crochet blog that tells whimsical stories with yarncraft. OPTIMIZED beautifully for phones and tablets. Both Woomi and Woomi Wins were handcrafted with love. To make Woomi, I learned to crochet. To make Woomi Wins, I learned to code; a process I'll detail in a future blog post. Until then, I hope you pick up the app and enjoy interacting with Woomi's action-packed plot to win the world! 1.5 years later, Woomi approves. 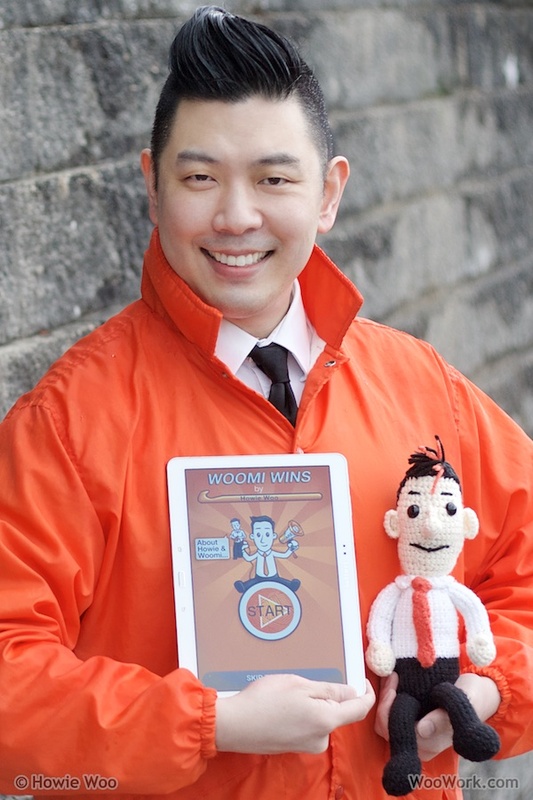 Me and Woomi with the "Woomi Wins" app.